Do you have joint pain or stiffness? Does it affect the quality of your life? 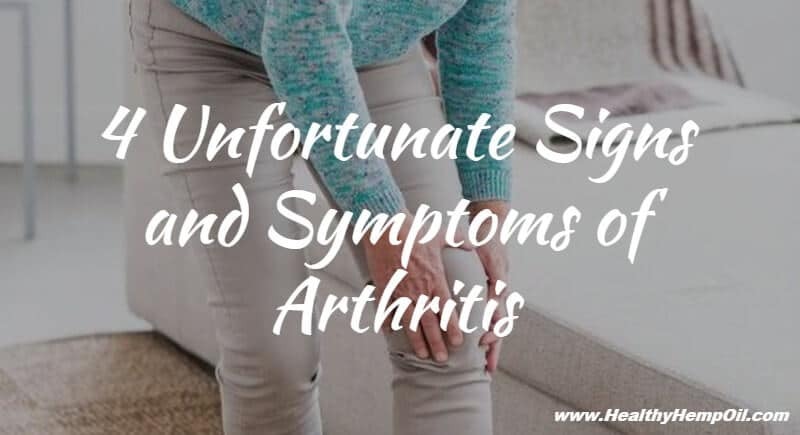 If so, read on, and learn about the important signs and symptoms of arthritis to find out if you have this disease and what you can do about it. Arthritis refers to joint pain or disease and affects over 50 million adults and about 300,000 children in the United States1. Arthritis is not strictly an age-dependent disease as it affects people of all ages as well both sexes and all races. However, women tend to have arthritis more commonly than men. It also tends to occur more often as people become older1. Arthritis is the primary reason for disability in the United States with employees losing more workdays due to arthritis than any other medical disability. The economic impact of arthritis is enormous with an estimated $156 billion in medical costs and lost wages every year2. In this article, I will cover the different types of arthritis, the important signs and symptoms of arthritis, and some coping strategies. Degenerative Arthritis – Osteoarthritis is the most commonly occurring kind of degenerative arthritis in which the cartilage on your bones wears away due to injury or overuse, and this causes the ends of bones to rub together. Cartilage provides a slippery and cushioning surface, and, without it, bones rubbing together results in pain, stiffness, and swelling. Left untreated, your joints become weak, and the pain becomes chronic. The risk factors for osteoarthritis include prior injury, family history, your age, and whether you are overweight. Inflammatory Arthritis – When your immune system is operating normally, it creates inflammation to fight off disease and eliminate infection. However, an abnormal immune system can attack your joints, resulting in unrestrained inflammation. This can cause the cartilage in your joint to wear away and harm your internal organs. Rheumatoid and psoriatic arthritis are common types of inflammatory arthritis. Medical experts believe an abnormal immune system or autoimmunity is the result of a combination of environmental and genetic factors. For instance, smoking can cause rheumatoid arthritis in those with the right genes. Infectious Arthritis – Not as common as degenerative or inflammatory arthritis, infectious arthritis occurs when a virus, fungus, or bacteria such as salmonella, gonorrhea, or hepatitis infects your joints and causes inflammation. Antibiotics have been successfully used to treat infectious arthritis, but sometimes, the infection leads to chronic arthritis. Metabolic Arthritis – Metabolic arthritis happens when your body produces too much uric acid or cannot eliminate it fast enough. If the uric acid buildup is high enough, this can lead to crystals in the shape of needles forming in your joints, resulting in sudden attacks of joint pain. If the level of uric acid is not lowered, this can lead to chronic pain. Pain – Arthritic pain can be intermittent or continuous. You might feel pain only when you are moving or when you are resting. You may feel pain in many different areas of your body or only in one part. Stiffness – Look for this warning sign particularly when getting up from bed in the morning, riding in your car for a long stretch, or sitting for a long time at your desk. Morning stiffness lasting for over one hour is a good indication of arthritis. Swelling – Arthritis can cause the skin over the problem joint to swell, feel warm, and become red. Swelling that extends longer than three days and happens over three times per month is a good warning sign. Hard to move a joint – A classic warning sign is experiencing pain or difficulty in moving a joint, bending down, or getting up from your chair. Rheumatoid Arthritis – In this arthritis type, your immune system attacks your joint, which causes a feeling of pain, swelling, and stiffness in your joint. These symptoms can continue for many hours and impact any joint, but they typically begin in small joints like those in your feet or hands. Stiffness is worst during morning hours, and pain tends to increase for the next few weeks or months. Osteoarthritis – This type of arthritis tends to affect the joints in your feet, knees, lower back, and hips. Stiffness can be intense but generally lasts for under 30 minutes and occurs mainly after getting up in the morning. Symptoms like swelling, warmth, and redness are small. Inflammation, however, can occur due to the cartilage breaking down in the joints. Psoriatic Arthritis – Symptoms associated with psoriatic arthritis include redness and swelling in your fingers, toes, ankles, and knees. You may also have pain in your neck and back and stiffness that slows your movement. Focus on what and how much you eat to keep a healthy weight. Take over-the-counter medicines like aspirin and Tylenol for pain. Use cold and hot therapy to bring the swelling down. Balance rest with doing activities. Arthritis can be debilitating for many people, but it does not have to be if you take care of yourself and become proactive in your approach. The first step is to learn all you can about the disease and the many signs and symptoms of arthritis. Next, visit your doctor, and learn about treatment options. Regarding treatment, the most important things you can do are to keep physically active and maintain a healthy weight. Have you correctly identified arthritis in yourself based on the signs and symptoms? What were your symptoms, and what did you do next? Let us know in the comments.